110 years ago today in 1903, Panama declared Independence from Columbia. 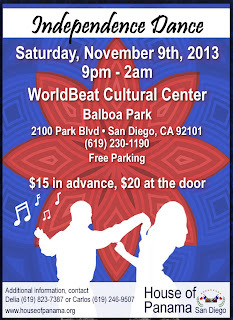 Join us next Saturday, November 9th at the WorldBeat Cultural Center as we celebrate with food, drinks, and dancing. We will also have live entertainment, a DJ, and video presentation. Get your tickets today by calling (619) 823-7387 or purchase them online and pick them up at the door. The House of Panama thanks you for your support!